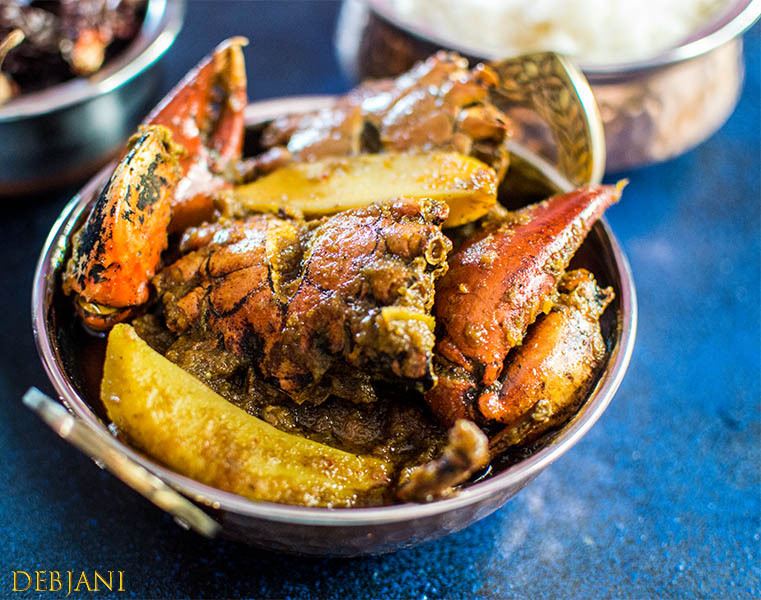 A typical, traditional Bengali style Kakrar Jhal or Bengali Crab Curry is something I was planning make for long! Yes, I didn’t attempt to make Kakrar Jhal so far in my kitchen until last week though I love this a lot. My Mom has a fear for that eating Crab in bulk may cause “Pet Kharap” (stomach problem)! She tries every possible thing to avoid making it. In my parent’s place Crab is almost a no-no 😛 . Given this, I always had Crab Curry at my friend’s places. 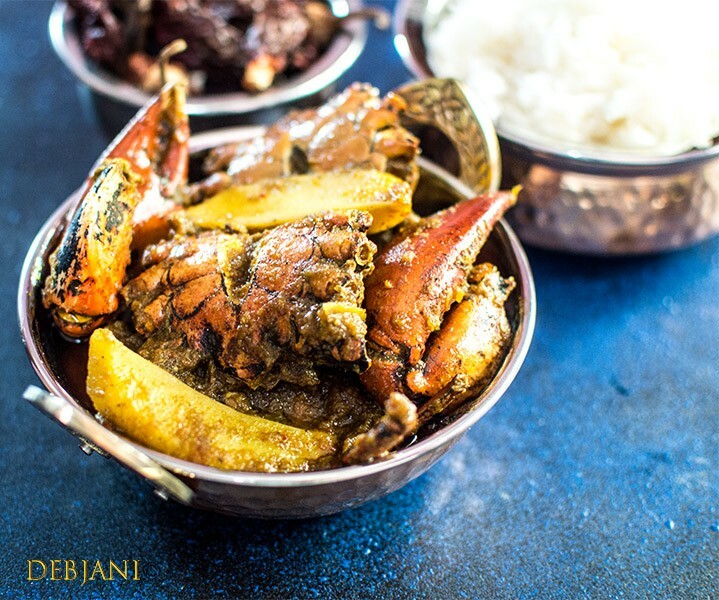 When we were in Gurgaon we used to try Bengali Restaurants for crab and somehow I didn’t make it at my place. I found a good lot of Crabs at the nearby market a few days back and finally called my best friend S to help me with crab. I didn’t even know how to clean it. She suggested me to ask the vendor to clean the Crab and shared a homely recipe for Kakrar Jhal or Bengali Crab Curry. I then consulted my little collection of cookbooks and web and found almost similar recipes there. I then purchased Crab last week from the known fish vendor at Patuli Market and he helped me with the cleaning process. What I found, he first opened the shell and discarded that along with the small legs. Finally, the inner part of the Crab and big legs were cleaned and he told me to cook those after a thorough washing at home. He shared the crab egg in a separate packet and suggested to add that in the curry for extra flavor. 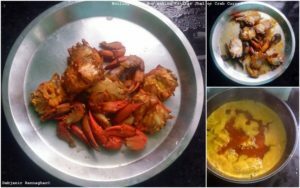 Following S’s process, I cleaned Crab pieces with warm salted water two times and then sprinkle some salt and turmeric powder over the pieces of crab followed by boiling crabs in hot water for five minutes. Water was discarded after that and Crab pieces were used for further cooking. “S” suggested me to add potato chunks while making the bong style Kakrar Jhal. Potato is my favorite and it gives a body to many dishes especially when it comes to Bengali Cuisine. 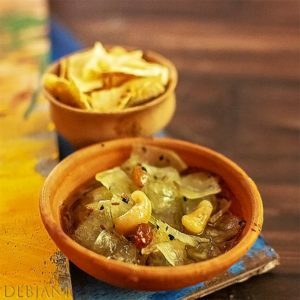 Bongs prefer their runny Murgir Jhol (chicken curry) or Kochi Pathar Jhol (mutton curry) along with big chunks of potatoes. However, while making Crab Curry I have added potato wedges instead of big chunks. 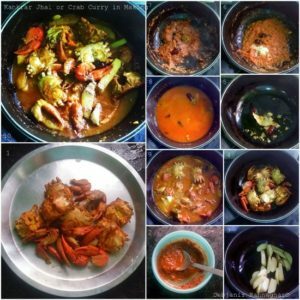 Rest is the use of some basic spices to make the curry which ended on a finger licking Crab Curry or Kakrar Jhal. 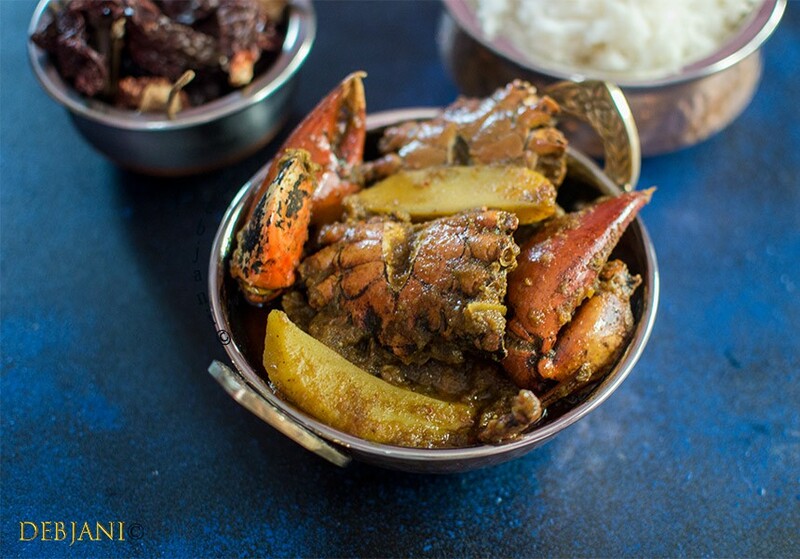 Kakrar Jhal or Bengali Crab Curry is a gravy based curry prepared with Crab and potato chunks and is a traditional Bengali preparation of Crab! Outer shell and small legs of each crab needs to be broken and discarded at first. Break big legs from the body of the Crabs and wash everything under running normal water. Add some salt to a bowl of warm water and wash Crab pieces with this Water. Now take a bowl full of water and bring it to boil. Sprinkle some salt and turmeric Powder over the crab pieces and add those to the boiling water and boil for 5 minutes in high flame. Discard the water and use these cleaned Crab for cooking further. Take all the spices mentioned under the ingredient list of spice mix which are Cumin Powder, Coriander Powder, Bengali Garam Masala Powder, Turmeric Powder, Kashmiri Red Chili Powder, Salt, Sugar and Mustard Oil in a bowl and mix using a spoon. Add little water if found the paste too dry and keep the spice paste aside for further cooking. Take cleaned Crab pieces and sprinkle and mix some salt and turmeric powder. Cut Potatoes into wedges and make paste or tomatoes and Onion separately. Take Oil in a deep bottom pan and heat the oil over medium flame. Shallow fry potato wedges in medium flame till those turn golden in color and strain from oil and keep aside. Shallow fry Crab pieces in the remaining oil and keep those aside too. Temper the oil with the whole spices (Whole dried Red Chili, Bay leaf, Whole Cinnamon, Cumin Seed and Whole Green Cardamom). When the spices start spurting add onion paste to it and start cooking in medium flame for 2-3 minute until onion changes color to light brown. Add tomato paste and cook for 2 minutes and then add ginger and garlic paste to it and cook till the spices mixed properly and oil separates from the edges. Add previously prepared spice paste to the pan and mix with a spatula and add 1 Tbsp. of water to it and then cook for 2-3 minutes or till the thick gravy emits aroma and releases oil from the edges. Now add 3 Cup of water and after mixing bring it to boil. Add fried potato wedges and fried Crabs and cook after covering the pan with a lid. Cook until the potatoes cooked properly and gravy thickens a bit. Adjust the water level according to taste; I prefer a bit runny curry. Add Ghee and Garam Masala Powder and give the curry a final mix and switch the flame off. 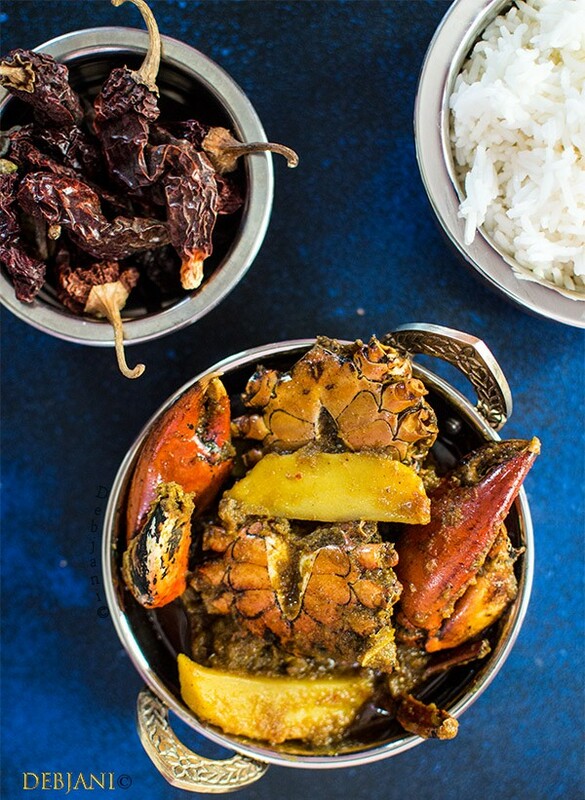 Serve Kakrar Jhal or Bengali Crab Curry with hot steamed rice. Do try the Bori Begun Aloo diye Ilish Macher Tel Jhol or Aloo Fulkopi diye Macher Jhol or Robibarer Murgir Jhol or Kochi Pathar Jhol.